Oh, pâte de fruits. I love ya, you big sweet sticky blob — I really do. You’ve managed to claw your way up near the top of the sugar confectionery pyramid, where you breath the same rarified, Frenchified air as calissons and Bar-le-duc jelly. You can be found taking a place of pride on the mignardises plate alongside the usual truffles and petits fours — the sole candy deemed worthy of doing so by the types of restaurants that need words like mignardise. Pretty damn good for a something that started life as overcooked jam. But, let’s be honest here. As a single, sweet, intense morsel at the end of a fatty meal, you’re aces. As a candy, though, you could use a bit of work. For one, you’re flabby. There’s no tooth to you. 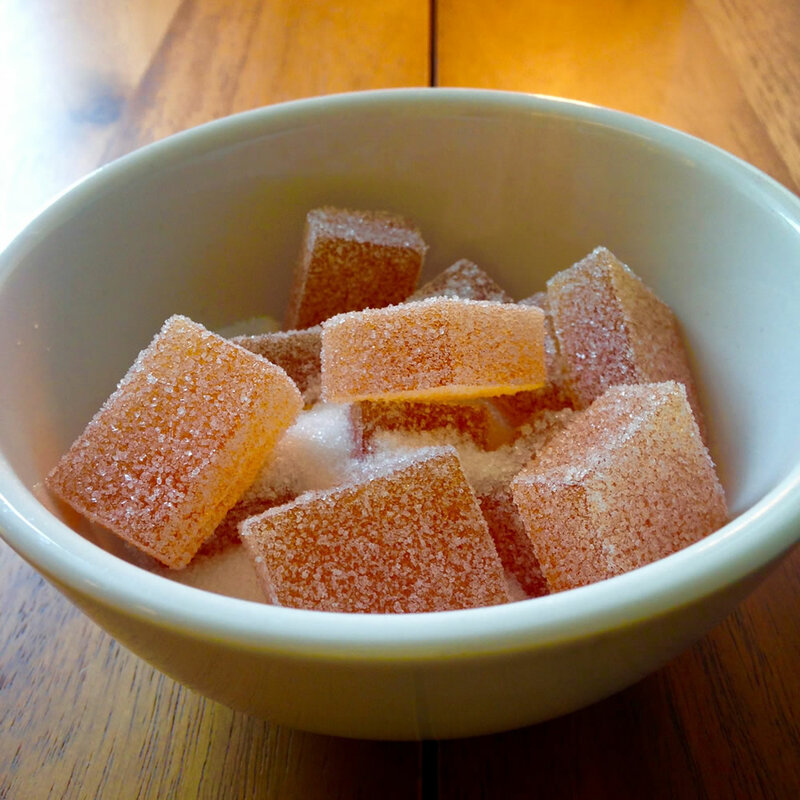 You blow apart in the mouth without any resistance, which can be a nice surprise on the first bite but gaggingly sweet on second. For another, you’re sweaty. Put you in a closed container, and you’ll ooze syrup until you’ve fused into a sticky block with all of your brothers and sisters. And, finally, you’re stewed. I mean that literally: a person has to boil the hell out of you to get you to gel, and along the way all of those bright, fresh fruit flavours are lost and replaced with the cooked, stewed flavours of jams and baking. Apple pâte de fruits. I snapped this photo quickly before these bad boys started to sweat. Essentially, it’s jam cooked to a higher temperature so that it gels firmly enough to slice. And so that the sugar content is high enough that it won’t ferment or get mouldy when stored at room temperature. Pectin is a complex polysaccharide — a soluble fibre — found in all sorts of fruits, and is the stuff that allows cranberries to magically turn into that heaving gelatinous mass called cranberry sauce when cooked down with sugar. Gel texture and behaviour vary depending on the source; don’t expect completely consistent results if you’re jumping back and forth between different makers or retail brands. Also, if you’re combining it with fruit that naturally contains some of its own pectin, you’re going to be faced with some dosage guesswork. In fact, some fruits contain so much pectin that you don’t have to add any at all. I saw this first-hand when I attempted to do pâte de fruits with fresh cranberries; the whole thing congealed into a grainy mess half way through cooking and ended up getting flipped straight into the garbage, still steaming. When done intentionally, though, it’s the idea behind quince cheese / dulce de membrillo / pâte de coing and similar traditional preserves made with apples, guavas, plums, haws, and so on. 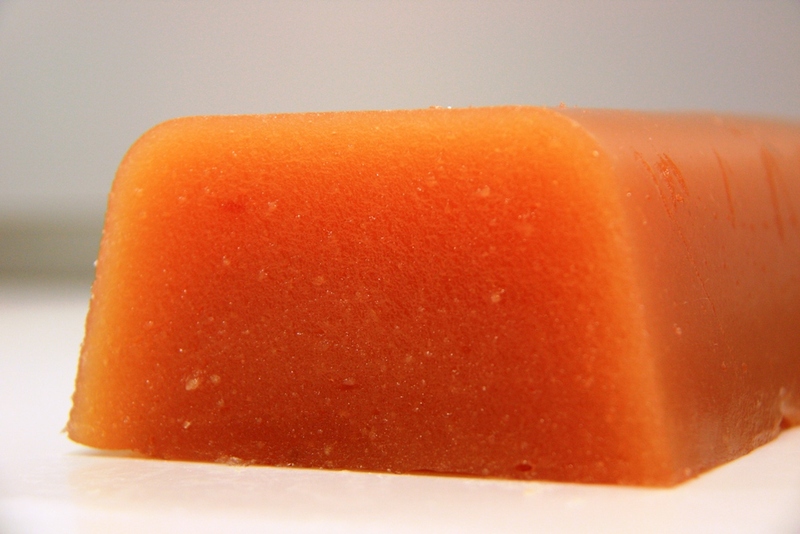 As gelling agents go, pectin is a picky one. It likes lots of sugar (usually at least 60–70° Brix, depending on the type of pectin) and a fair amount of acid too (pH 2.8–3.6, which is lime to apple territory). The former is not a problem at all in candymaking, but the latter can be tricky. Too little acid, and the gel won’t set properly. Too much acid too early, and it’ll set up with a granular texture or, worse, gel in the pan while you’re still cooking and create a great big lumpy hot mess. That’s why many pâte de fruits recipes call for a charge of additional acid in the form of lemon juice right at the end of cooking. That brings us to the other trouble with pectin: it likes to sweat. As in, weep lots and lots of sticky syrup as it sits in storage. Syneresis is what it’s technically referred to — the expulsion of moisture from a gel matrix. You’ve seen it happen to jars of jam that grow syrup puddles after sitting undisturbed for a while. In practical terms, it means that no matter how much and how lovingly you apply your sanding sugar to pâte de fruits, they’re probably just going to wait until your back is turned to get all goopy again. Even in high-quality shops, the pâte de fruits often look like they’re dying from influenza inside their wrappings. I’ve been led to believe that, in restaurant kitchens, pastry chefs get around this by making their jellies in small batches and applying/reapplying the sanding sugar right before serving. I’m neither a pastry chef nor have I ever worked in a restaurant. So, you know, I may be full of it. Please pipe up if I am. Next time: Playing with pâte, respectin’ the pectin.